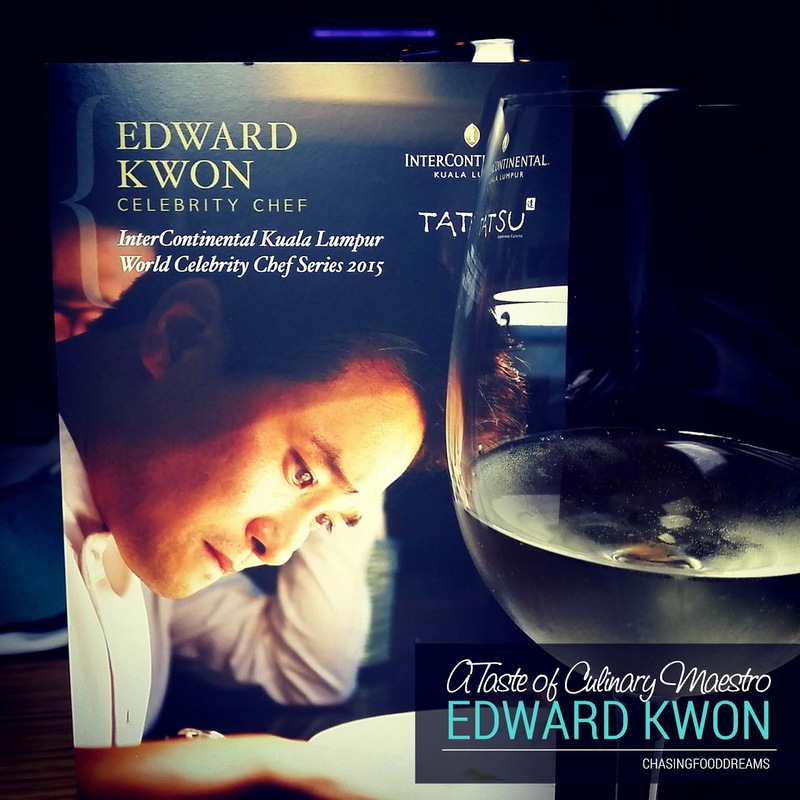 A Taste of Korean Culinary Maestro Chef Edward Kwon! It’s a gastronomical experience not to be miss! 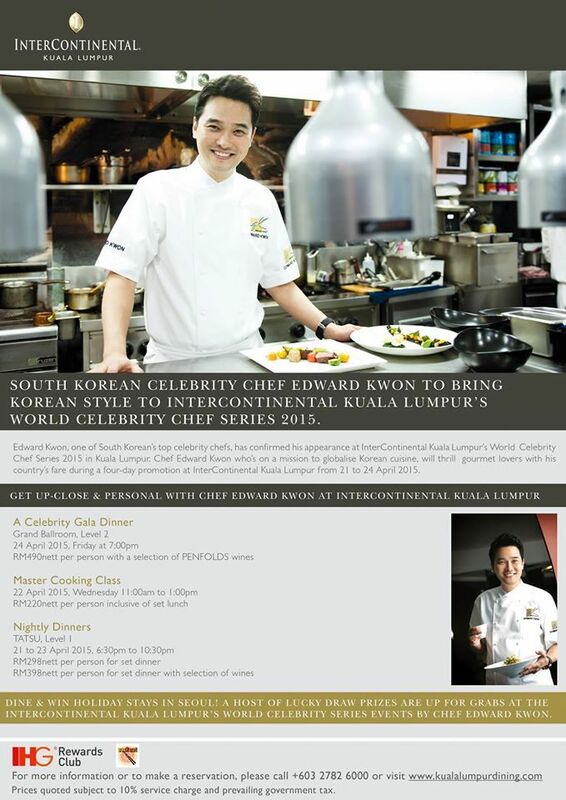 Intercontinental Kuala Lumpur World Celebrity Chef Series 2015 is proud to present an exclusive Get Up-Close & Personal with South Korean Celebrity Chef Edward Kwon from 21 April to 24 April, 2015. It will be a four-day promotion of Restaurant Dinners, Master Cooking Class and Celebrity Gala Dinner at the hotel’s various dining venues. The culinary maestro, who’s on a mission to globalise Korean cuisine, is renowned for compositions of Korean dishes married with Western and European techniques and ingredients. About Kuala Lumpur, Chef Edward Kwon said “I cannot wait to return to Kuala Lumpur, it has been two years since my last visit”. This culinary star is a household name in Korea following several high-profile culinary ambassadorships, best-selling cook books and having appeared on numerous popular radio and TV shows including hosting several highly rated TV shows under his name. The celebrity chef is also known for his numerous senior culinary positions previously in luxury hotels located in South Korea, United States, China and United Arab Emirates, as the Head Chef at Dubai’s iconic Burj Al Arab. Currently the owner of two restaurants in Seoul, the luxury Lab XXIV in Cheongdam-dong and The Mixed One, a buffet dining outlet in Hannam-dong, Chef Edward Kwon added that it is important for any chef to represent his or her own country cuisine but one must also absorb the culinary techniques of whichever country he/she is cooking in. It was a privilege to be able to experience Chef Kwon’s gastronomical dishes at TATSU the evening before together with members of the media and bloggers. The Restaurant Dinner, a four-course Set Dinner, is available at TATSU from 21 to 23 April 2015 at RM298nett per person or RM398nett per person inclusive of wine selection. For the appetizer course, diners are to choose from a choice of Hae Mul Nang Chae or Soft Bean Curd. A pretty composition of chilled prawn, scallop, pear and greens in sesame dressing, the Hae Mul Nang Chae or Seafood Salad has clean and precise flavours of its ingredients. It showed off the freshness of the ingredients in its simplest form of taste. Before we even began to savor the dish, it had already won a piece of my heart through its presentation that evening. The 2nd course was pure indulgence with goose liver taking center stage. A nuptial of French and Korean, the bisque was velvety smooth and luscious with savory as its main flavour. Every spoonful of the bisque was divine. Crowning the bisque was a small piece of seared foie gras sitting on a bed of delicate kimchi apple slaw. I was surprised at how refine Korean kimchi can be in this dish. Our star of the evening was a surprise for me. Expecting thinly shredded beef from its name of Bulgogi, I was pretty stoked to see a sonata of gorgeous pink cuts of prime quality beef rib eye artfully arranged on mashed root vegetables and accompanied by the most classic and basic forms of carrot, broccolini, bok choy and Eryngii mushrooms in a pool of Bulgogi sauce. The beef was amazing in flavours and textures. The sauce epitomizes the classic Bulgogi in every sense. The tiny potent crispy garlic worked its magic over the beef and sauce like the final piece of the gastro orchestra. Kudos to Chef Kwon! Yuzu, a much-sought after Asian citrus fruit, is the perfect way to wrapped up the dinner. Its signature vibrant and aromatic notes are cleverly paired with black sesame ice cream, green tea, bokbunja chiffon cake and basil fluid gel. Despite the complicated list of ingredients, the dessert still had the citrus fruit standing out in every spoonful. 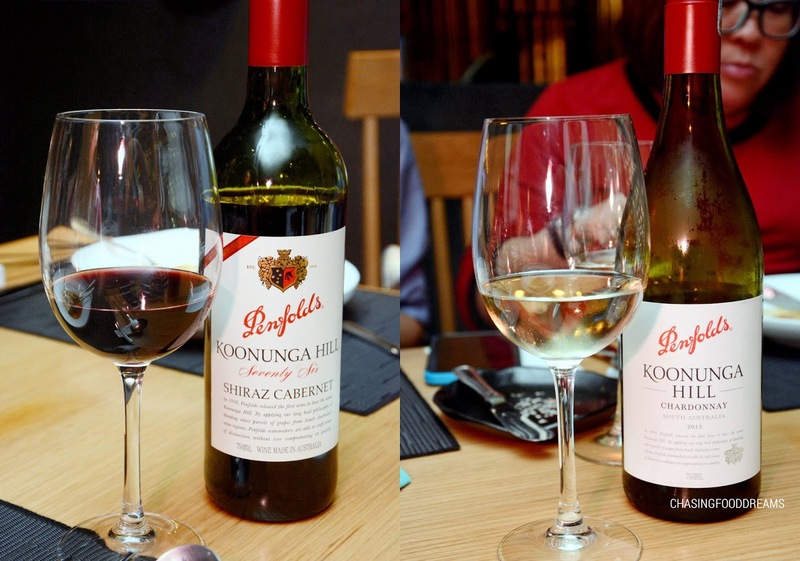 Guests will stand a chance to Dine & Win holiday stays in Seoul! 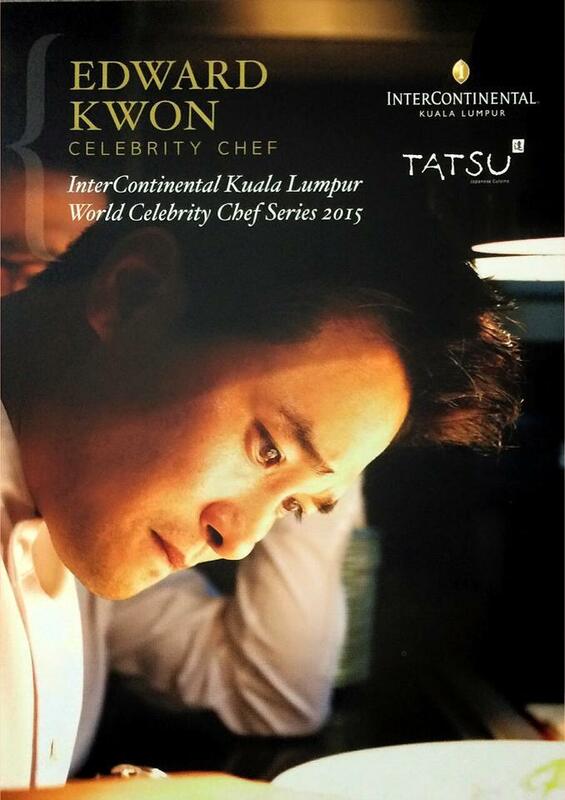 A host of lucky draw prizes are up for grabs at the InterContinental Kuala Lumpur’s World Celebrity Series 2015 featuring celebrity Chef Edward Kwon. For reservations or more details, please call us at 03-2782 6000 or email foodandbeverage@intercontinental-kl.com.my. Visit us at www.intercontinental-kl.com.my, follow us on Facebook and Instagram @intercontinental.kualalumpur, Twitter @ interconkl.